At the corner of Green Lane and Morris Avenue in Union, New Jersey, stands a striking new structure marking the west entrance to the campus of Kean University. Deliberately positioned where it can be seen from the main road, the new Green Lane Academic Building signifies both a gateway and an icon for a thriving institution with an inclusive appeal to a wider community. 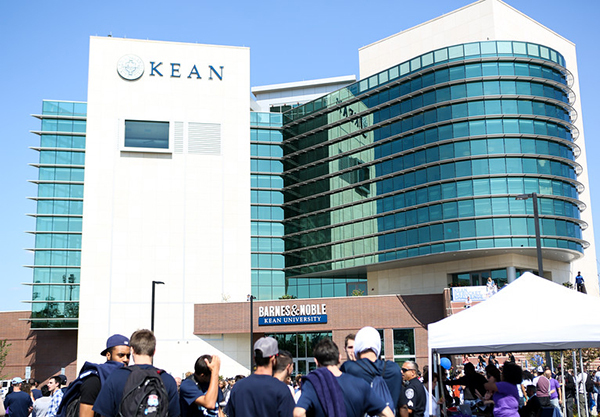 The mixed-use six-story building opened earlier this year and is a testament to the University’s commitment to that sense of community and to an initiative by President Dr. Dawood Farahi, as part of the “Vision 2020” strategy, a comprehensive, strategic guide for the future growth and development of Kean University. It’s also a testament to a long-term partnership between the University and Barnes & Noble College. Moving into the dramatic glass, stone and brick building, the Barnes & Noble at Kean University bookstore dramatically expanded its space by occupying 18,000 square feet of the new building — and staff and visitors to the new store have been quick to appreciate the new location. The main doors are fronted with the store’s convenience section for students to pick up food and snacks on the go, and an area featuring seasonal items such as back-to-school or holiday supplies. The dramatic 32-foot ceilings extend into the interior of the store, with wall space adorned with Kean Cougar-inspired artwork and old prints of the Kean campus throughout its history. A shopper can instantly see the different departments such as an enlarged trade book area, clothing, and textbook sections. “Quite frankly it’s a building where we can create the kind of bookstore Kean deserves,” says Barnes & Noble College Regional Manager, Neil LeBeau. Designed by award-winning firm, Gruskin Group of Springfield, N.J., Dr. Farahi had specific criteria the building’s architects needed to meet. “We wanted a building where you could tell its use just by looking at it, we wanted a building where the architecture was arresting and made you look up, and we wanted a building that reflected our campus mission and was itself part of the learning experience,” he recalls. The anchoring of the Green Lane Academic Building with the bookstore is an integral part of that mission, Dr. Farahi explains. “This is why Barnes & Noble fits into what we do here. 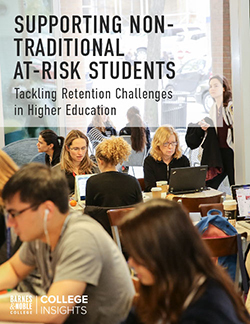 It’s not a typical academic store, it’s an open, diverse environment to buy supplies, obtain your learning materials, enjoy coffee and interact with other students ─ it becomes itself part of the learning experience,” he says. Acting Bookstore Manager Jason Figueroa stands inside the trade book section of the new Barnes & Noble at Kean University bookstore. A central focus of the building is the new Barnes & Noble College café, providing indoor and outside seating, and plentiful soft furnishing throughout. But a store is more than just its bricks and mortar, and even before its grand opening, staff were working to provide a service experience that was fully integrated with the needs of Kean students and staff. 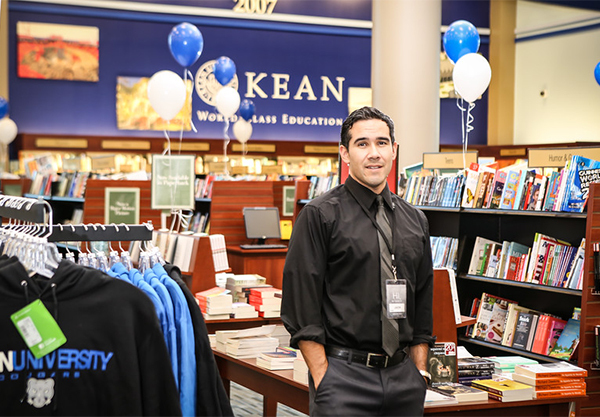 “Reaching out to the Kean faculty, for example, has resulted in much greater success with textbook adoptions,” explains Acting Bookstore Manager, Jason Figueroa, “and the new space now allows for the store to be more efficient by providing a wider range of options and improved choices for our students,” he adds. LeBeau agrees. “Going into the new store we enjoyed a great relationship with faculty staff and students, but the new space is really affording us the opportunity to meet people and build relationships with different organizations on campus and really offer up the space for the community to use as a gathering place,” he says. A case in point, was the store’s first celebrity author event, with Kathy Wakile from the Bravo television series, The Real Housewives of New Jersey, introducing her new book Indulge, attracting both campus and community constituents. The store’s recent grand opening provided another community opportunity — that also celebrated and supported a great cause. In addition to hosting a barbecue with DJ, and food sampling throughout the store, the festivities also included Barnes & Noble College executives, Paul and Bill Maloney, officiating an ALS Ice Bucket Challenge led by President Fahari, and raising $40,000 for the ALS cause. 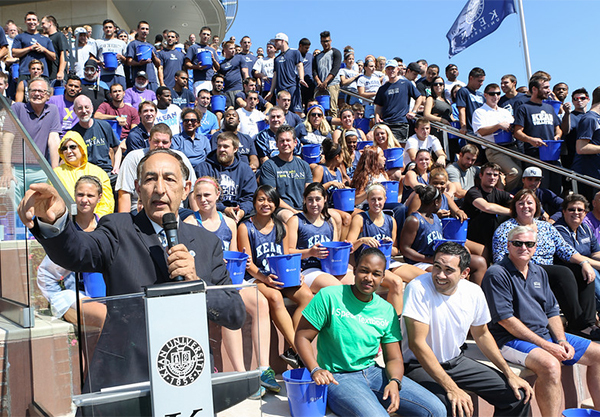 Kean University President Dr. Dawood Farahi addresses the audience moments before he and 200 students, faculty and staff participate in the ALS Ice Bucket Challenge. The event raised $40,000 to help find a cure for ALS. The new Academic Building is just the latest development in a remarkable expansion at the university. 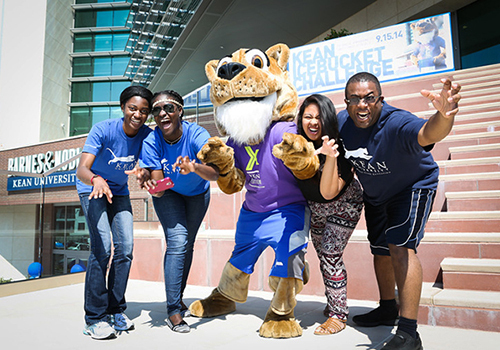 Within the past few years, Kean has completed renovations of its East Campus building, built two residence halls, a new STEM building, a learning center to support science and sustainability initiatives, and even the founding of a full-scale campus in China to facilitate international education and exchange initiatives. “The future of higher education is global,” Dr. Farahi points out. 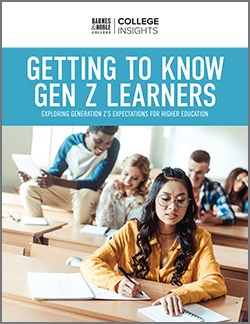 “It’s the only value-added commodity that doesn’t recognize national barriers and we need to enable our students to not only succeed but flourish in the workforce of a global environment,” he says.